We had a really exciting week! In three days, we hatched 19 chicks (out of 27) which is over a 2/3 hatch rate! Pretty good!!!! And definitely FUN!!!! What happens when you let Kids take charge? I could not be prouder of these kids! They came up with an idea to help others less fortunate half a globe away! Just so you know, I had barely anything to do with this project!!!! This was pure Kids doing what Kids can do when you don’t tell them what to do, when you set no limits, when you just listen and say yes you can do that! The day of the show, the janitors asked how many chairs we would need for the event. I had no idea so I said 100, picturing half of them empty. I also told them to just leave the chairs out. Kids stayed after school, set the whole gym up, ate donated pizza (thank you Maddy’s mom), and waited for the crowd to appear. It wasn’t long before the kids were in search of MORE chairs!!! The night was amazing! I never touched a dollar of the money. The kids handled all of it! The show was perfect (not adult perfect, but kid perfect!) I also want to note that I didn’t spend a cent on cups or plates or any of the supplies the kids sold (except the 3d printed stuff) which is unusual for a teacher “in charge” of a school event. The kids did it all! It was the kids all the way! And for those of us heading into our golden age, it is good to know, we are in good hands! The Slide presentation below was written and presented by our class president, Tristen. A 360 degree video of the talent show. The sound is not great, but it is fun to move the screen around and look at what's going on from different angles. Students have really been working hard after school this week on their HIP Academy project. 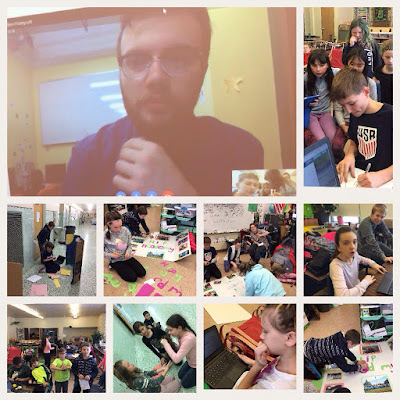 On Friday, they plan to have a talent show to raise funds to send 3d printed educational items, books they have written themselves, and books they have collected to the school in Africa where our friend and Skype partner Livingstone Kegode works. Today we skyped with our mutual friend and CEO of Open World Cause, Ben Honeycutt. Ben lives and teaches in Colorado Springs and this is the second time we have skyped with him this year. He gave us a lot of information about Livingstone and the school that will come in handy for the introduction of our show tomorrow night. Below are pictures of us skyping with Ben and various pictures of students who stayed after school working on projects. Today two of my four classes had the honor of Skyping with the amazing Livingstone Kegode a teacher in Kimilili, Kenya. We Skyped with him earlier this year and he inspired my students so much that they have been learning Swahili using a program called Duolingo. They created digital animal research projects and picture books for his students. This Friday they are hosting a talent show, bake sale and selling their own homemade wares to raise funds to ship 3D printed animals, letters and numbers to their Kenyan friends. They have also been collecting books for an organization called Books for Africa that has a warehouse in Atlanta, Georgia. Part of the money they raise will go toward shipping the books to Atlanta. That organization will take the books to Africa and personally give the books to children in the villages in Africa. I am very proud of my students. Until this week this has been a truly student-driven project. I am only stepping in now to help with the last minute logistics of their plan. These KIDS ARE AMAZING! and thank you, Livingstone, for inspiring them to do great things! Help Livingstone Kegode Save the HIP AFRICA School! Open World Cause. Skyping with Livingstone and his students.